Background: Idiopathic pleuroparenchymal fibroelastosis (IPPFE) was recently proposed as an entity to be included among rare idiopathic interstitial pneumonias (IIPs). However, the cause, clinical features and prognosis of this rare entity have not been elucidated. Objectives: We aimed to examine the clinical features, outcomes and prognostic factors for IPPFE in comparison to those of idiopathic pulmonary fibrosis (IPF). Methods: We retrospectively analyzed 20 patients with IPPFE and 71 with IPF. We compared clinical features, blood examination data, and respiratory functions at the time of diagnosis. 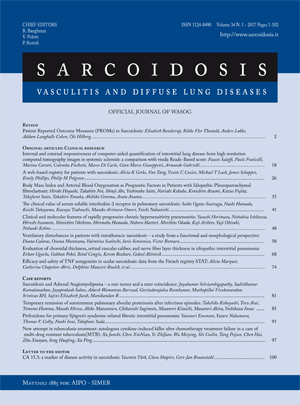 Results: The IPPFE group had a significantly lower body mass index (BMI), percent forced vital capacity (%FVC), total lung capacity (%TLC) and expiratory reserve volume (%ERV), as well as a higher residual volume to TLC (RV/TLC) ratio than the IPF group. The annual FVC changes in the IPPFE group (-326ml/year) were significantly larger than those in the IPF group (-142ml/year). Survival was significantly poorer in the IPPFE than in the IPF group (P = 0.021). BMI and the partial pressure of oxygen in arterial blood (PaO2) were significantly related to the outcome of IPPFE. Conclusions: Our present results indicate the prognosis of IPPFE patients to be poorer than that of IPF patients. We advocate that BMI and arterial blood PaO2 be determined at the first visit as these parameters are closely related to patients’ outcomes. Prospective evaluation of IPPFE starting in the subclinical phase is necessary to assure that appropriate measures are taken before progression.